One of these festivals is the Juicy Brews Summer Invitational organized by Hop Culture, an on-line beer website/publication with daily features on subjects covering the world of craft beer. Triple Crossing Brewing was a natural choice for a festival featuring 33 breweries, mostly from up and down the east coast, but with several from as far away as Arizona, California, and Colorado. Triple Crossing, which was founded by friends Jeremy Wirtes, Adam Worcester, and Scott Jones in 2014, is one of Richmond’s most highly regarded breweries. The original location, near downtown Richmond, on Foushee Street, was so successful that a second, much larger brewpub and production facility was built in Fulton, a neighborhood east of downtown. Triple Crossing-Fulton opened in December 2016. It features a gas fired brick pizza oven, a beer garden with a patio, and lots of space for the numerous barrel-aging projects currently underway. The smaller Foushee location has a 7-bbl brewhouse, where many of Triple Crossing’s original beers, such as Falcon Smash, a hazy New England-style IPA, were perfected in small batches. The Foushee site is now used mostly to brew small batch and experimental beers. The food offerings in this cozy brewpub include gourmet grilled cheeses, chips and salsa, cheese straws, and ice cream sandwiches. Triple Crossing is among the most versatile breweries in RVA: head brewer Jeremy Wirtes crafts various session beers such as a Czech Pils, Hoppy Table Beer, and many different fruited Berliner Weisse-inspired brews. Porters and stouts feature largely as well. 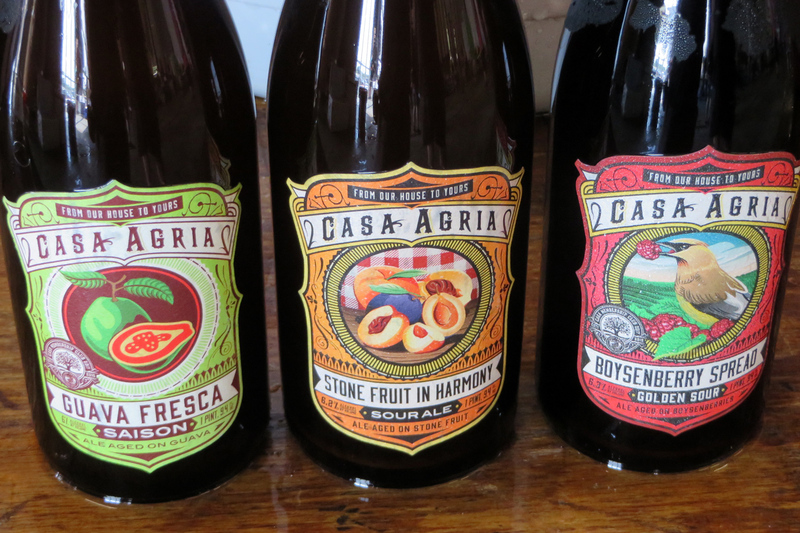 There is also an experimental series of sour brews, some of them fruited, called Proximity Project Wild Ales Series. Recent examples include White Rabbit, which the brewery describes as “A golden sour that was inoculated with a mixed culture of brewer’s yeast and native wild microflora from our brewery grounds in Fulton, and left to age in oak barrels.” This beer has a nearly lambic-like, mellow acidity and pleasing mouthfeel. Another called March Hare is a complex 5% golden sour that was inoculated with a mixed culture of yeast and bacteria, that was aged in oak barrels for over 12 months. Triple Crossing Brewing added a coolship (in an enclosed room) to its Fulton location in 2017, and produced a number of batches of spontaneously fermented worts during the 2017-2018 winter season, which are now aging in oak barrels. Look for more information from the brewery in the future about their spontaneous fermentation program, which is only in its infancy at present. Richmond thirsts for IPAs, more than any other beer. Especially the hazy kind. Triple Crossing’s Green Dreams, Interstellar Burst, and Nectar and Knife are among the stellar Double IPA offerings from the brewery. Cans and drafts are usually released for sale on Fridays at noon at the Fulton location, and the very high in demand brews often sell out in a day or two. Some of Triple Crossing’s fruited, session-strength Berliner Weiss inspired brews, such as Waxing Poetic with Raspberry, are among the most highly regarded sour brews crafted in RVA. Waxing Poetic with Raspberry had a very low acidity and fantastic fruit character. The newest such beer is Soldiers of Summer, a Berliner Weisse-style brew made with 100% whole Raspberries, which was brewed in collaboration with Hop Culture for the occasion of the Juicy Brews Summer Invitational. The festival featured two sessions on Sunday, June 10 at the Fulton location. Triple Crossing’s brick pizza oven was in heavy use during the whole day, cranking out a variety of Neapolitan-style thin crust pizzas. Also regularly available at both Triple Crossing locations are delectable desserts in the form of Nightingale Ice Cream Sandwiches, which are hand made by Hannah Pollack and husband Xavier Meers. Meers is Belgian, and his ice cream sandwiches are made with local ingredients, including many made with beer from local RVA breweries. See nightingaleicecream.com. 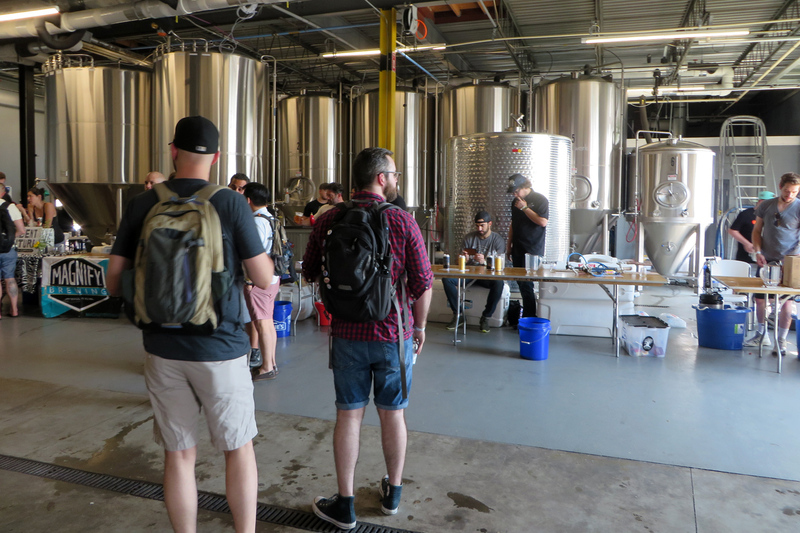 The Hop Culture Juicy Brews Summer Invitational featured saisons, sour beers, and IPAs, and a few other beers, hence the name. 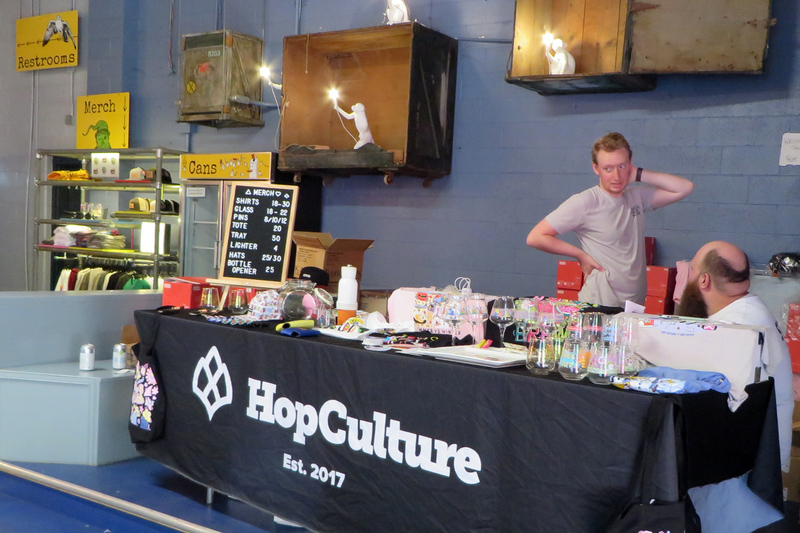 Hop Culture was founded by Kenny Gould and Travis Smith, who are based in New York, N.Y. The on-line magazine publishes articles on the topic of beer, five days a week. See hopculture.com. Some of the impressive breweries at the festival included Brewery Bhavana, one of Raleigh, N.C.’s premier breweries and restaurants. The multiple varieties of delicious dim sum, duck egg rolls, various dumplings and other Laotian cooking at Bhavana are superb, and reservations are usually needed to get a table. If you just want to sample the beers, or wait for a table, there is a long bar where you can drink some of the many beers brewed by head brewer Patrick Woodson. Look for saisons, grisettes, Belgian dubbels, tripels, and others, often brewed with non-traditional ingredients. As well, beers brewed with brettanomyces and juicy IPAs are among Bhavana’s fortes. Piglette, a tart and funky Belgian grisette with 3.8% abv, brewed with brettanomyces yeasts and sour cultures, was on offer at the festival, as was Grove, a citrusy Double IPA with 8% abv. See brewerybhavana.com. Also in attendance was The Answer, the beloved brewpub from here in Richmond, with TI ESREVER DNA TI PILF, NWOD GNIHT MY TUP, a Triple IPA brewed in collaboration with Hop Culture. See theanswerbrewpub.com. Virginia Beach’s Commonwealth Brewing, another brewery making a lot of interesting sours, farmhouse ales, mixed fermentation beers with barrel-aging, and IPAs, brought Tinta Rosa, a sangria-inspired Gose Ale. It is made with pomegranate, plum, raspberry, and oranges, and has 5.45% abv. Commonwealth also had a DIPA, a Triple IPA, and a pilsner on offer. Commonwealth is based in an old fire and rescue station and has an outdoor beer garden. The brewery is located on Pleasure House Road. One can only wonder where a name like that came from. See commonwealthbrewingcompany.com. There were over 200 different beers on offer at the festival, which was run smoothly by the Hop Culture and Triple Crossing crews. It was a great event! Oxnard, CA’s Casa Agria Specialty Ales and founder Ryan Exline were also on hand, pouring Boysenberry Spread, Stone Fruit in Harmony, and Guava Fresca. The latter beer was one of the stars of the show. Guava Fresca is described by the brewery as: “A variation of Casa Agria’s house beer, Agria de la Casa, specifically made for the CASA Bottle Membership Club. Agria de la Casa is brewed with oats, rye, and spelt, and is mix-fermented with a blend of Saccharomyces, Brettanomyces, and bacteria, before being oak aged. Guava Fresca is pulled straight from the foeder, gently dry-hopped with Nelson Sauvin, and conditioned with Guava Nectar.” What a superb saison it is, melding tropical fruit flavors and mild acidity. The former two beers are also both delicious, barrel-aged sours. See casaagria.com. Also from California, Cellador Ales from North Hills had several very interesting wild beers on, such as Carrot King, a Lambic-inspired sour, bottle conditioned with carrot juice. Also on offer was The Gutless Wonder, a blended wild ale with Boysenberries and Marionberries. See celladorales.com. Kent Falls Brewing Company of Kent, CT, brought its Flourish, a blend of farmhouse ale and spontaneously fermented beer, aged with Montmorency cherries. Burley Oak Brewing Company of Berlin, Maryland, offered Açaí Bowl J.R.E.A.M., brewed with blueberries, strawberries, açaí, and banana. Burley Oak added a small amount of cinnamon and brown sugar to the beer. The respected brewery also had another Berliner Weiss and a Double IPA on hand. See burleyoak.com. 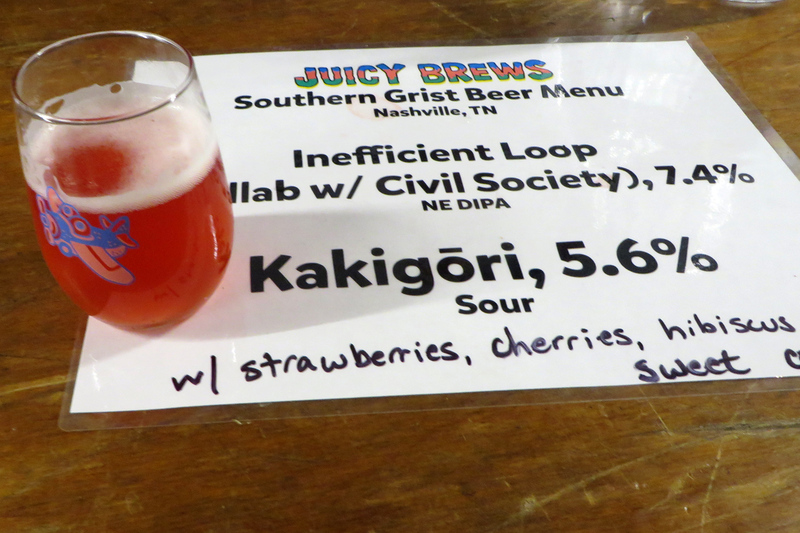 Bond Brothers Beer Company of Cary, N.C., one of the Raleigh-Durham area’s highly regarded breweries, brought Double Fruitcup Sorcery American Kettle Sour with Cherries, Guava, Strawberry, and Apricot. Bond Brothers also offered Long Draw, a DIPA with Simcoe and Vic Secret hops. See bondbrothersbeer.com. Charles Towne Fermentory, of Charleston, S.C. featured La Vida Gose #4, brewed with Tangerine & Blood Orange, as well as Extra Sunny DIPA. See chsfermentory.com. Two of Northern Virginia’a premier breweries, Aslin of Herndon and Ocelot of Dulles, brought sours and hoppy IPAs. See https://www.aslinbeer.com/ and http://ocelotbrewing.com/. Also on hand were Barreled Souls Brewing of Saco, Maine; Brix City Brewing of Little Ferry, NJ; Dancing Gnome Beer of Pittsburgh, PA; District 96 Beer Factory of New York, NY; Foam Brewers of Burlington, VT; Hoof Hearted Brewery and Kitchen of Columbus, OH; Horus Aged Ales of Oceanside, CA; Imprint Beer Co. of Hatfield, PA; Magnify Brewing of Fairfield, NJ; Mast Landing Brewing Co. of Westbrook, Maine; New Park Brewing of West Hartford, CT; Outer Range Brewing Co. of Frisco, CO; Red Dragon Brewing Company of Fredericksburg, VA; Resident Culture Brewing Company of Charlotte, NC; Southern Grist Brewing of Nashville, TN; Superstition Meadery of Prescott, AZ; and Wren House Brewing Company of Phoenix, AZ. Both Triple Crossing locations are open from Monday through Thursday from 4 pm to 10 pm, Friday and Saturday from 12 pm to 10 pm, and on Sundays from 12 pm-8 pm. See triplecrossingbeer.com. For more info about other Hop Culture events and beer festivals, see hopculture.com/events. Charles “Chuck” Cook is a freelance writer living in Richmond, VA. His passions are beer and travel. He has written for various publications and for the Celebrator since 2002. He can be reached at chuck@beerandtravel.com.